June 15, 2008. (Photo from Olga Kiseleva). Leading Paschal service reader in Beijing, Apr. 27, 2008. Old Tianjin. (Photo from Abp. Hilarion of Sydney). 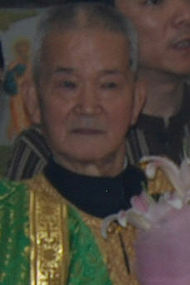 Protodeacon Evangelos (Lu) Yaofu resides in Shanghai. According to Abp. Hilarion of Sydney, until recently, he had no contact with other Orthodox. When Fr. Vladimir Boikov paid a visit to Shanghai to meet with the Orthodox, Fr. Evangelos was persuaded to come and received Holy Communion. As he is advanced in age, he is currently not prepared to receive catechumens or unfamiliar Orthodox visitors. In 2008 Fr. Michael Wang Quansheng and Protodeacon Evangelos Lu Yaofu, the only indigenous Orthodox clergy left in China, took part in Divine Services for the first time in 46 years, at the Russian consulate in Shanghai, and were awarded medals of the Venerable Sergius of Radonezh (I Degree) by Patr. Alexei of Moscow. Timeline of Orthodoxy in China. Ecclesiastical awards presented to clerics of the Chinese Autonomous Orthodox Church, March 13, 2008. Protodeacon Evangelos Lu Yaofu at Orthodoxy in China. This page was last edited on May 13, 2013, at 15:19.